According to another version, "Great Grandfather William Palmer was born in South Carolina in 1774. We suppose he was English. . . William had two brothers, Josh and ( ). The father of three boys is supposed to be one of three Palmer brothers who came to America in Colonial days. One of the three boys returned to England or at least took shipping to return to care for their aged Mother, whom they left there. We do not know whether this son got back to England or not." Research has not yet uncovered information on three Palmer brothers. At this time, evidence points toward a man named Joshua Palmer as our earliest-known ancestor. He was born in England probably in the 1740s and died in Indiana before 1820. As a young man he immigrated to South Carolina and became a farmer and Baptist minister. Joshua Palmer emigrated from England, settling first in the Lower Fork of Lynches Creek region, appearing in the Charleston Association by 1785; he obtained surveys of 150, 100, and 133 acres in 1785 and 1786 on or near Lynches Creek; he was living in Cheraws District without slaves in 1790; after serving as minister of Lower Fork of Lynches Creek and an active delegate to the Charleston Association 1789-92, he appeared in Bethel Association as minister of Upper Duncans Creek Church 1793-1808, when he left for Indiana with a large number of his congregation and was pastor of Dry Fork Church, Whitewater Association, in 1812, dying before 1835; he was an eloquent but uneducated preacher, of singular manner and no pride, zealous in performing all associational functions and in helping such neighboring churches as Padgetts Creek, Durbin Creek, Friendship, Poplar Springs, and Lower Duncans Creek (from all available evidence and dates of service, the Joshua Palmer who served Charleston Association was the same as the Joshua Palmer who served Bethel Association, although there was a Joshua Palmer in Union County in 1790). Joshua Palmer was the first Pastor of this church, after its re-organization. He emigrated from England, and took charge of the church about the year ‘90. In ‘88 this church was one of the sixteen that composed the Bethel Association. Under the labors of the Pastor, together with those of Reuben Kelly and Spencer Bobo, ministers in the church, many souls were added, of such as should be saved. In 1803, the number added by baptism was 141, which made the total number of members, at that time, 302. In 1808, this church was left destitute by the removal of their beloved Pastor to Indiana, and their number reduced to 285, by the emigration of a considerable number in company with him. Here a church was formed, of which he became the Pastor, and labored faithfully, until it pleased his Divine Master to call him home. Hundreds have owned him as their spiritual father, and his name will outlive many generations. He was somewhat singular in his manners, and a stranger to pride. His opportunities of acquiring human learning had been limited, but his eloquence was simple, yet powerful. He spoke as one who felt that he was surrounded by the bulwarks of truth. A passage identical to the one above was published in the 1835 minutes of the Reedy River Baptist Association. It was part of a section of the minutes called "Statement of the rise, progress, and present state of the Churches of the Reedy River Association, furnished agreeably to the request of the Association, Sept. 1834." Since it speaks of Reverend Joshua Palmer as being deceased, we know that he had to have died before September 1834, and thus could not be the same man as Captain Joshua Palmer of Union County, South Carolina, who died 5 December 1835. Biographical and Genealogical History of Wayne, Fayette, Union and Franklin Counties, Indiana, was published in 1899. The information on Joshua was apparently supplied by his grandson, Hiram Sparks, whose mother, Mary Palmer, married William Sparks. The father of Mrs. Sparks, Rev. Joshua Palmer, well deserves mention in this article. He and the Rev. Miner Thomas were among the noted pioneer Baptist preachers of this part of Indiana. Joshua Palmer was a native of England, and served on an English ship at sea, for three years, and then came to the United States when a very young man. He located in South Carolina, married and entered on his career as a Baptist minister. He had two sons, Joshua and William, besides the daughter, who became Mrs. William Sparks. It appears that when Joshua Palmer decided to emigrate north with his family he had appointments to preach at various places and felt that he must fill those engagements. It was therefore determined that the mother and children should come north in advance of the father, who would follow later. So the family, after making due preparations, started on their long journey. When passing through the state of Kentucky the mother became seriously ill, and they camped at a place now known as Crab Orchard. In that vicinity they found the hut of a settler and decided to remove the sick mother to it. On entering the hut, however, they found it unfitted for such a purpose, and returned to their wagon, and there the children had the sad experience of witnessing their mother die. Tenderly they laid her to rest and carefully marked the spot, and sadly the children continued their journey to Indiana. Later, when the father and husband came north, he sought and found the lone grave in Kentucky, where he tarried for a time, and while there collected the scattered settlers and preached to them the gospel of eternal life beyond the grave. These events proved to be an awakening influence that resulted in the organization of a Baptist society at Crab Orchard, and finally the erection of the first church at that place. Rev. Joshua Palmer settled in Union county [Indiana] where nearly all of the rest of his life was spent, engaged in the work of the ministry. After taking up his residence in Indiana he often returned to Crab Orchard and preached to the people, and his visits were always warmly welcomed. Although Townsend states that Joshua settled first in the Lynches Creek region of South Carolina (today Chesterfield and Darlington counties), there is evidence he came to the colony more than twenty years earlier. Joshua Palmer was granted at least four tracts of land in Fredericksburg Township, Craven County between 1762 and 1775. Craven County originally covered the eastern half of the state. Fredericksburg Township corresponded to the area around the modern-day city of Camden in Kershaw County. All the land Joshua received was located on the north side of the Wateree River, near Sanders Creek and Rocky Branch Creek. Pursuant to a precept from the Hon. Egerton Leigh Esq. Surv General dated April ye 5th 1762 I have admeasured unto Joshua Palmer a tract of land containing one hundred acres, in Craven County, Fredericksburg Township Bounded to the S.W. by Wateree River, to the S.E. by land already surveyed and vacant land, and on all other sides by vacant land and hath such form and marks as the above plat represents. Certified by me this 14th day of May 1762. Saml Wyly, D.S. The memorial for the property was recorded on 18 November 1762. This land was sold by Joshua Palmer to Richard Stratford in 1792. Pursuant to a precept from John Troup Esq DSG dated the 4th day of December 1764, I admeasured unto Richard Marks a tract of land containing one hundred acres, the N.E. side of Wateree River, in Craven County, on Rocky Branch the waters of Santee: Bounded on the S.W. side by land laid out for Charles Jant [Gent] and George Jones, and on all other sides by vacant land. And hath such form and marks as the above plat represents. Certified by me this 21st day of Decr 1764. Jno. Belton, D.S. This tract is significant because on 20 December 1785, Joshua Palmer of Craven County, Baptist Preacher, sold land with same description to John Chesnut of Camden. Joshua is erroneously indexed as Joseph Palmer in a grant for 150 acres in Craven County dated 6 December 1768. Sixteen years later, on 19 April 1786, the same land was included in a sale from John Milhouse to Richard Champion. The deed describes land on Rocky Branch which was granted to Joshua Palmer on 6 December 1768 and sold by Joshua Palmer and wife Jane on 19 October 1769 to Thomas Vaughan and also from them 1 October 1769 to Isaac Vaughn. The chain of title passes from Isaac Vaughn and Mary Vaughn, widow of Thomas, to James Bettie in 1772, and from Bettie to John Milhouse in 1776. If this is our ancestor Joshua Palmer, then we know that he had a wife, her name was Jane, and that they were married by 1769. Jane’s maiden name is not known, nor is it known if she was the mother of Joshua’s children. Joshua’s daughter, Mary, who married William Sparks, named her four oldest children Zachariah, Joshua, Jane, and Mary. William Sparks’ parents were named Zachariah and Mary. The other two children might have been named for Mary’s parents, Joshua and Jane. Sometime before 1781, Joshua became a Baptist minister. He was known to have a limited education, but that was not an obstacle. Reverend Richard Furman wrote in 1791, “a great part of our ministers as well as members are very illiterate men.” According to one source, “deacons frequently served on trial for a time before being ordained. The church either would call an ordained minister as pastor or put forward one of its own members to exercise his gifts as a preacher. If the church decided that such a one had the necessary qualifications, he was usually licensed to preach, and, after a year or even less in some cases, his church, or one desiring to use his services, arranged for his ordination.” Two or three visiting ministers usually examined the candidate’s qualifications and laid hands on him to complete the ordination. Estate of Andrew McLennan; citation published by Joshua Palmer. Estate of John Hope; citation read at John Moore's mill by Joshua Palmer. Estate of Malachai Howell; citation read in Joshua Palmer's congregation. Estate of William Tillman; citation published at Ephraim Pools by Joshua Palmer. Estate of Thomas Starke; published in a congregation at David Clentons Mill on Singletons Creek by Joshua Palmer. Estate of Lewis Perkins; published in a congregation at Mr. Hortons on Hanging Rock [Creek] by Joshua Palmer. Estate of Richard Tucker; citation published at Richard Stratford's by Joshua Palmer. Estate of William Cassell; citation published in Mr. Palmer's congregation. Most of these preaching engagements took place during the Revolutionary War, but no record has been found showing that Joshua served in the army or furnished supplies for the fight. Not every man served in the war. According to one estimate, there were about 1500 Baptist men of military age living in South Carolina at the time. Of those, it can be determined that about 600 fought or provided supplies. Joshua apparently moved east to Cheraw District after the war. The district consisted of present-day Chesterfield, Darlington, and Marlboro counties. Revd Joshua Palmer was granted 150 acres near Lynches Creek in 1785, bordering on land granted to William Oins [Owens]. In 1786, tracts of 100 and 300 acres were surveyed for Joshua Palmer on the north side of Lynches Creek, and in 1791 he was granted 1,000 acres, bordering land he already owned. On 24 June 1789 Pugh noted: “all day Setling a Division of ye Ch.h between Palmer and Owens – Near ye fork of Linchs Creek – lodgd at Wethertons.” The Charleston Association reported in its minutes of 12 December 1789 that “a letter from a church in the lower fork of Lynch’s creek, constituted by Rev. Messrs Evan Pugh and Edmund Botsford in the course of the present year, was received, praying to be admitted a church of the union, which was agreed to.” Joshua became minister of this church, which had 39 members at that time. The 1790 census lists Joshua Palmer in Cheraw District with one male over 16, two males under 16, and 4 females. These must have been Joshua, his wife, his sons William and Joshua, his daughter Mary, and two unidentified females. He had no slaves. Listed on the next line is Richard Stratford. As already mentioned, Reverend Joshua Palmer held a service at Richard Stratford’s in Camden District in 1783. Stratford was living near Camden as early as 1769, when he and Robert Morriss, ship carpenters, sold 100 acres of land in the High Hills of Santee to Isham Moore. Richard “Stradford” was granted 150 acres in Fredericksburg Township in 1770, and three more grants of 100, 96, and 150 acres on Wateree Creek and Dutchmans Creek in Camden District in 1785. He apparently moved near Joshua in Cheraw District. In 1790 Richard was granted 330 acres on Lynches Creek. Listed after Joshua Palmer and Richard Stratford on the1790 census is John Nelson. He was a Revolutionary War veteran and Stratford’s son-in-law. In 1790 John Nelson was married to Ruth Stratford by Joshua Palmer, “minister of the Baptist persuasion,” in Kershaw County at the home of her father, Richard Stratford. ​Rev. Messrs Henry Holcombe, Joshua Palmer, and Gabriel Gerrald attended as messengers from the Charleston Association, and delivered a letter and the minutes of their last meeting, which were severally read. In consequence of a request made by this assn to that of Charleston, these gentlemen were unanimously and affectionately received into union and communion with us, and took their seats accordingly. In September 1792, Joshua sold a tract of 100 acres to Richard Stratford. The description of the land—“on North east side of Wateree River Craven County Fredericksburgh Township bounded to the South west by said river to south east by lands already surveyed and vacant land & on all other sides by vacant Land”--matches that of the first grant that Joshua received back in 1762. Interestingly, in the deed Joshua is called a cooper and Richard Stratford a ship carpenter. This might be a clue to their early occupations since coopers and ship carpenters were both employed on sailing vessels. Had they met while working on the same ship? Like Joshua, Richard was from England. He is said to have been born on 18 March 1743 at Randwick, Standish, Gloucestershire. He died 17 October 1813 at Camden, Kershaw County, South Carolina. On 23 November 1794, Matthew Gaston of Greene County, Georgia sold 150 acres on Duncan’s Creek in Laurens County to Joshua Palmer, clergyman. The land was originally granted to John Cary in 1768. A land grant atlas places the two tracts just south of Goodwin’s Crossroads in Laurens County. The 1800 Census of South Carolina lists Revd Joshua Palmer in Laurens County with 1 male 16-26, 1 male over 45, and 1 female over 45. These were Joshua, his wife, and his youngest son, Joshua Jr. Joshua’s oldest son, William, and son-in-law, William Sparks, were also listed as heads of households in the same neighborhood. None of these families owned slaves. As Townsend points out, “from all available evidence and dates of service, the Joshua Palmer who served Charleston Association was the same as the Joshua Palmer who served Bethel Association.” The earliest date found in which Joshua is active as a minister in Bethel is August 1793, when he was appointed a supply minister to fill a vacant position at Padgett’s Creek Church in Union County. He became minister of Upper Duncan’s Creek Church in Laurens County the same year. On 27 May 1794 he and 16 others signed a petition to the South Carolina General Assembly to incorporate, stating that “the Baptist Society in Lawrens County on Dunkins Creek Under the Cear of Joshua Palmore Humbly sheweth that Your Petitioners have it in Contemplation to Build Three Meeting Houses in the Bounds of Their Congregation it Being Very Large & Pray to become incorporated agreeable to the Laws of their Country and Known By the Name of the Upper Baptist Church on Dunkins Creek”. While in charge of his own church, Joshua filled in as a substitute at other churches. According to one source, he was invited to preach at the house of Edward Garrett Sr. in Laurens County about 1790 or 1791. Later the congregation built a log house on Garrett’s land where Joshua continued to preach and eventually Warrior’s Creek Church was formed. Townsend disputes the founding date, saying Warrior’s Creek was not known as a church until 1805. In 1796 Joshua was sent to substitute at Poplar Springs Church. In 1801 he served at Durbin’s Creek when their minister became ill. Between 1802 and 1805 he filled in several times at Tyger River (now Friendship) Church in Spartanburg County. Friendship’s records show he was paid $14.50 in December 1804 and $2.18 ¾ in February 1805. He served at Beaver Dam and in 1807 was present when it was constituted into a church. Townsend remarks that Joshua was “zealous in performing all associational functions.” In 1796 he and Richard Shackleford were appointed messengers to the Georgia Association. Joshua was also sent to Georgia as a messenger in 1804. In 1802 he served on the Association’s Committee on Business, along with Richard Shackleford, David Lilly, Davis Collins, and John Rooker and in 1804 he was appointed to a committee of correspondence assigned to collect materials for a history of the Association. Joshua was evidently a popular and convincing speaker. As previously pointed out, it was said of him that “his eloquence was simple, yet powerful. He spoke as one who felt that he was surrounded by the bulwarks of truth.” In 1795 he delivered the introductory sermon at the Bethel Association’s annual meeting, held at Jamey’s Creek Church in Spartanburg County. He took as the subject of his sermon Romans 12:5: “So we, being many, are one body in Christ, and every one members one of another." In 1802 David Lilly reported that large crowds attended the preaching of ministers Moses Holland of Big Creek Church, Joshua Palmer of Upper Duncan’s Creek, Augustine Clayton of Bethlehem, and Thomas Greer of Padgetts Creek. In 1803 alone, 141 persons were baptized into the church, increasing membership to 302. An 1804 book, Village Sermons, or Fifty-Two Plain and Short Discourses on the Principal Doctrines of the Gospel Intended for the Use of Families, Sunday-Schools or Companies Assembled for Religious Instruction in Country Villages, lists Rev. Joshua Palmer of Laurens County as one of the subscribers. He was also called upon to ordain new ministers. In 1799, at Padgett’s Creek Church, he ordained Frederick Crowder, Spencer Bobo and Thomas Greer. On 8 August 1807 he and Richard Shackleford, David Lilly, and William King were appointed to ordain James Teague and Charles Crow. The ordination took place on 29 August at Bush River Baptist Church in Newberry County. This was probably one of his last ministerial functions in South Carolina. Between 1801 and 1804, a number of Joshua’s neighbors left the state for the Whitewater Valley of what is now eastern Indiana. They built nine cabins along the East Fork of the Whitewater River in what was called the “Carolina Settlement.” Joshua was there by 1807. Records show that Joshua Palmer Sr. purchased 162.5 acres on 18 June of that year. The land is described as the southeast quarter of Section 11 in Township 11 North, Range 2 West of the First Prime Meridian. At that time the property was located in Dearborn County, but things changed rapidly as the population increased. One long-time resident said, “We were first in Dearborn County; then new counties were organized and we were in Wayne. Another change was made and we were in Franklin. Then Fayette County was organized and we lived in that county, and lastly the legislature took territory from Wayne, Franklin, and Fayette, and made little Union County, and thus we lived in five counties and all the time in the same log cabin.” Nearly half of Joshua’s congregation also went to Indiana. One source states that 187 members left, leaving a congregation of 285. As previously discussed, the story came down in the Sparks family that Joshua had preaching commitments in South Carolina, so his family moved to Indiana ahead of him. At what is now Crab Orchard, Kentucky, his wife fell ill and died. A descendant gives the date of her death as 6 July 1807. A similar story was recorded by Belle Palmer, a descendant of Joshua’s son, William: “. . . they started to Indiana, taking William's mother with them, William walking and leading their one horse, on which his mother rode. At a place called Crab Orchard, or Crabapple Orchard, the mother became ill, and after a time, William and his family continued their journey, leaving the mother there." In another version, a descendant wrote, "after they had traveled across North Carolina and into Kentucky, the mother was taken ill and died. She was buried at Crab Orchard, Kentucky." In a third version, it is stated that William's mother "became ill in a town called Crab Orchard in Kentucky and had to be left there. We don't know whether she died or was just left." A fourth version says it was William’s mother-in-law who traveled with them: "In 1805 William with his wife and her mother (Maiden name unknown) and his first child by Jane - Eda Palmer - started on horseback to Indiana. William walking ... the mother became ill and after staying at a place called Crabapple Orchard for a time, they left her to die among strangers. We think she was left in Tennessee." If Joshua personally entered land on 18 June 1807, he was able to get back to South Carolina by 8 August, when, as mentioned above, he was appointed to officiate at the ordination of Charles Crow and James Teague. As already mentioned, Joshua’s grandson Hiram Sparks claimed that his grandfather founded the first Baptist church of Crab Orchard, Kentucky about 1807. Although he may have preached in the area, the church had been in existence for at least 15 years before that. Spencer states that William Bledsoe was in the area as early as 1789 and helped constitute the Cedar Creek Church in Crab Orchard in 1791. Interestingly, Peter Bainbridge, whom Joshua ordained in 1790, was preacher of the Baptist church in Lancaster, Kentucky, from about 1798 to about 1813. Lancaster is about 13 miles from Crab Orchard. Joshua was a resident of Indiana by 1809. In that year, Joshua Palmer and William Sparks signed a petition to Congress requesting the right of Indiana residents to elect their own representatives. In the same year, the names Joshua Palmer and William Palmer appear on a list of voters at an election held for territorial representative in the sixth election district of Dearborn County. This district comprised the eastern part of present Union County and the northeastern part of Franklin County. The first tax list of Franklin County, Indiana in 1811 includes the names Joshua Palmer Sr., Joshua Palmer Jr., William Palmer, and William Sparks. A second tax list shows that Joshua Palmer owned 162 acres in Franklin County in 1812. Joshua Palmer received his final certificate for the southeast quarter of Section 11 in Township 11 North, Range 2 West on 29 December 1808. His two sons owned adjoining sections. Joshua purchased the northeast quarter of Section 11 on 11 November 1814. He is not called "Jr." in the record, which may mean his father was already deceased. A record has not been found for William Palmer’s purchase of his land, but on 20 November 1815, he and his wife Jane sold part of the southwest quarter of Section 11 to Jacob Alexander. William Sparks, Joshua’s son-in-law, purchased land in Section 34 in Township 11 in 1809. Joshua Palmer was affiliated with several churches on the Indiana-Ohio border. Indian Creek Baptist Church was organized in 1810 with elders Joshua Palmer, Moses Frazee, and William Tyner officiating. The church was located in Reily Township in Butler County, Ohio. Townsend states that Joshua was pastor of Dry Fork of Whitewater Baptist Church in 1812. This church is said to have been in Harrison Township, Hamilton County, Ohio. Benedict’s General History of the Baptist Denomination, published in 1813, lists Joshua Palmer as pastor of New Hope Church, with a membership of 69. The church was constituted in 1807 and may have been located near New Hope Cemetery, located a mile and a half south of what is now the town of Roseburg in Harmony Township, Union County. Joshua was apparently the Joshua Palmer who was married to Mary “Losey” on 8 September 1811 in Franklin County, Indiana. The bride probably was Mary Luffsey or Lovesey, mother-in-law of Joshua’s daughter, Mary, who was married to William Sparks. William’s father, Zachariah Sparks, died in South Carolina during the Revolutionary War. His mother, Mary, remarried to Francis Luffsey or Lovesey. On 1 September 1786, Francis and Mary “Luffrey” were named as administrators of Zachariah’s estate in Ninety-Six District in South Carolina. On the 1790 census, Francis Lufsey is listed as head of household in Laurens County next to William Sparks. Francis died probably before 1800, as he is not listed on the census for that year. He had a daughter, Joanna, who married Robert Glidewell. 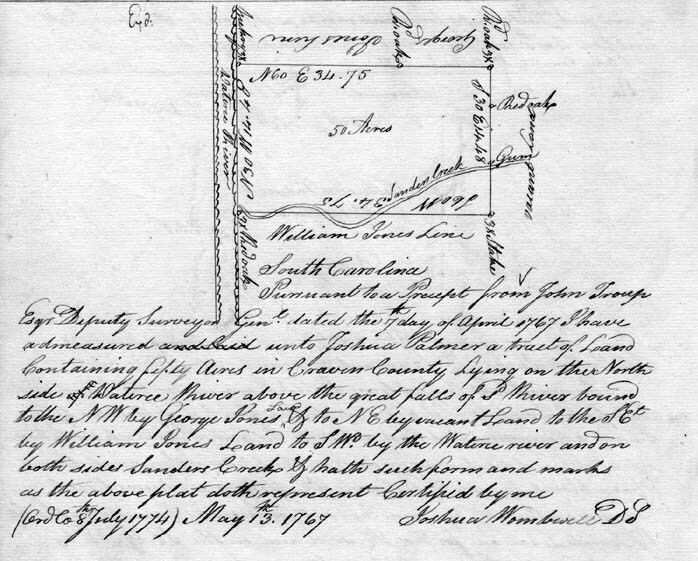 Robert and Joanna sold land on Duncan’s Creek in Laurens County in 1805. In 1806, Robert Glidewell purchased land in section 34 of Township 10 North, Range 2 West in what was then Dearborn County, Indiana. Today this land is in Union County. Joshua was probably still alive in 1813. In May of that year, Joshua Palmer Jr. was named a road supervisor in Franklin County. The designation “Jr.” must have been used to distinguish him from his father. There is only one Joshua Palmer listed as the head of a household on the census of Liberty Township in 1820. The oldest male in the family is between 26 and 45 and thus must be Joshua Jr.
Reverend Joshua’s wife, Mary, died 27 January 1823. James Conaway was named administrator of the estate of Mary Palmer in Union County, Indiana. He was probably Mary’s son-in-law, as he was married to Sarah Sparks. James Conaway is listed on the 1800 census of Laurens County, South Carolina next to William Palmer and William Sparks. On 15 October 1823 Joshua’s son-in-law and daughter, William and Mary Sparks, sold 94 acres in the east half of section 11 in Township 11 North Range 2 West. At least part of the land apparently originally belonged to Joshua, so may have been their inheritance. Belle Palmer, “Palmer History” (typescript, 1958), p. ; copy in the possession of Donna Meszaros, Phoenix, Arizona. Isabel “Belle” Palmer of Oakland, Iowa (1878-1963) was a great-great granddaughter of Rev. Joshua Palmer. Genevieve Howard, “Family History” (typescript, 1984), p. ; copy in the possession of Donna Meszaros, Phoenix, Arizona. Two-page typescript on Everton Publishers' form A3. At the end of page 2 is the statement, "Copied from Win Palmer's notes. 1984." Genevieve Howard (1910-2003) was great-great-great granddaughter of Rev. Joshua Palmer. She resided in Rapid City, South Dakota. Allen F. Hall, “A Brief History of My Mothers Family” (typescript, 1966), p. ; copy in the possession of Donna Meszaros, Phoenix, Arizona. Allen F. Hall (born 1885) was a great-great grandson of Rev. Joshua Palmer. Leah Townsend, South Carolina Baptists, 1670 to 1805 (1935; reprint; Baltimore: reprinted for Clearfield Co. by Genealogical Publishing Co., 1990), 227, note 125. I. M. Allen, The Triennial Baptist Register No. 2-1836 (Philadelphia: Baptist General Tract Society, 1836), 186. Reedy River Baptist Association (S.C), "Minutes of the Reedy River Baptist Association, Convened at Betharbra Church, Laurens District, S. C., September 18, 1835, and Dates Following" in Minutes of the Reedy River Baptist Church, North Greenville Baptist Association, South Carolina, 1799-1914; microfilm pub. no. 1171 (Nashville, Tenn.: Historical Commission of the Southern Baptist Convention, 1961), p. 14. "Hiram Sparks," Biographical and Genealogical History of Wayne, Fayette, Union and Franklin Counties, Indiana (Chicago: Lewis Publishing Co., 1899), 897. Robert K. Ackerman, South Carolina Colonial Land Policies (Columbia: University of South Carolina Press, 1977), 3. GeLee Corley Hendrix, “Going Beyond the Database—Interpretation, Amplification, and Development of Evidence: South Carolina’s COM Index and Several James Kelleys,” National Genealogical Society Quarterly 86 (June 1998): 120. Brent H. Holcomb, Petitions for Land from the South Carolina Council Journals, Volume V: 1757-1765 (Columbia, S.C.: SCMAR, 1998), 79. South Carolina, “Colonial Land Grants (Copy Series),” database, South Carolina Department of Archives and History (http://www.archivesindex.sc.gov/Default.html : accessed 30 September 2008), entry for Joshua Palmer, 1762, citing series S213184, vol. 7:267, item 1. South Carolina, “Memorial Books (Copy Series),” database, South Carolina Department of Archives and History (http://www.archivesindex.sc.gov/Default.html : accessed 30 September 2008), entry for Joshua Palmer, 1762, citing series S111001, vol. 6:3, record 3. Kershaw County, South Carolina, Deed Book A:164-168; FHL microfilm 24,404. South Carolina, “Colonial Land Grants (Copy Series),” database, South Carolina Department of Archives and History (http://www.archivesindex.sc.gov/Default.html : accessed 30 September 2008), entry for Richard Marks, 1764, vol. 10:238, item 2. Holcomb, Petitions for Land from the South Carolina Council Journals, Volume VI: 1766-1770, 71. South Carolina, “Colonial Land Grants (Copy Series),” entry for Joshua Palmer, 1767, vol. 19:40, item 2. Lancaster County, South Carolina Deed Book D:56-58; FHL microfilm 24,054. South Carolina, “Colonial Land Grants (Copy Series),” entry for Joseph Palmer, 1768, vol. 19:40, item 2. Lancaster County, South Carolina Deed Book A:166-169; FHL microfilm 24,054. I. M. Allen, The Triennial Baptist Register No. 2-1836, 186. Joe M. King, A History of South Carolina Baptists (Columbia, South Carolina: General Board of the South Carolina Baptist Convention, 1964), 144. Brent H. Holcomb and Elmer O. Parker, Camden District, S.C. Wills and Administrations 1781-1787 (1770-1796) (Easley, S.C.: Southern Historical Press, 1978), 45. Joe M. King, A History of South Carolina Baptists (Columbia, South Carolina: General Board of the South Carolina Baptist Convention, 1964), 140. South Carolina Land Plats 7Q:91, 8 January 1785. FHL microfilm 22619. South Carolina Land Grants 6:5, 4 July 1785, FHL microfilm 22546. 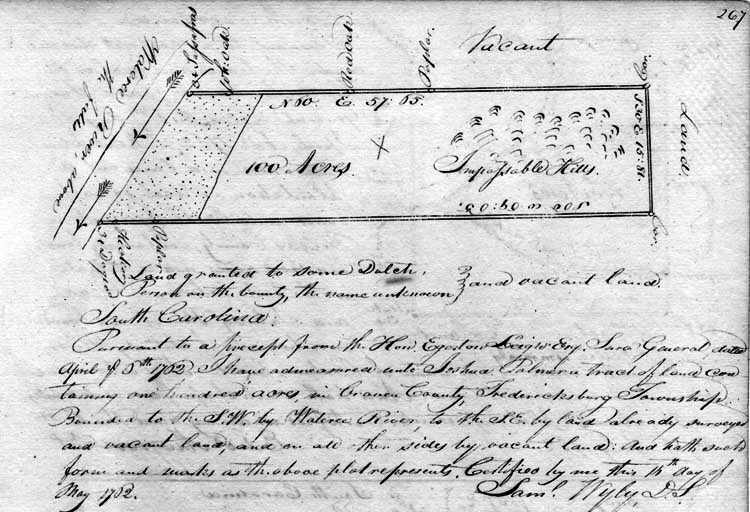 South Carolina Land Grants 24:379, 6 October 1788, FHL microfilm 22552. South Carolina Land Plats 27Q:431, 20 October 1791, FHL microfilm 22624. Horace Fraser Rudisill, transcriber, The Diaries of Evan Pugh (1762-1801) (Florence, South Carolina: St. David’s Society, 1993), 240. Pugh was pastor of Cashaway Church. Charleston Baptist Association (S.C.), “Minutes of the Charleston Association : High Hills of Santee, October 24th, 1785” Early American Imprints (Worcester, Mass. : American Antiquarian Society, 1955-1983), microopaque, first series, no. 25281, p. 1. Edmund Botsford was minister of the Welsh Neck Baptist Church. Richard Furman was in charge of the Baptist church at High Hills of Santee from 1779 to 1788, when he became pastor of the Charleston church. Charleston Baptist Association (S.C.), “Minutes of the Charleston Association : Black Swamp, December 12th, 1789” Early American Imprints (Worcester, Mass. : American Antiquarian Society, 1955-1983), microopaque, first series, no. 25285, p. 2. Benjamin Moseley was pastor of Ebenezer Jeffreys Creek Church. Horace Fraser Rudisill, transcriber, The Diaries of Evan Pugh (1762-1801) (Florence, South Carolina: St. David’s Society, 1993), 290. Ibid., 327. Wetherton was William Witherington, owner of a mill on Lynches Creek where church services were occasionally held. Charleston Baptist Association (S.C.), “Minutes of the Charleston Association : Black Swamp, December 12th, 1789,” p. 1. Townsend, South Carolina Baptists, 102. J.H. Spencer, A History of Kentucky Baptists from 1769 to 1885 (1885; reprint; Gallatin, Tennessee: republished by Church History Research & Archives, 1984), 2:115-116. G. Robinson, “Peter Bainbridge,” transcription, Baptist History Homepage (http://baptisthistoryhomepage.com/bainbridge.peter.html : accessed 5 November 2009), citing The Christian Repository (August 1856), 92-100. James A. Rogers, Richard Furman: Life and Legacy (Macon, Georgia: Mercer University Press, 2001), 122. Horace Fraser Rudisill, transcriber, The Diaries of Evan Pugh (1762-1801, 330. 1790 U.S. census, Cheraw District, South Carolina, p. 357, col. 1, line 183, entry for Joshua Palmer; digital image, Ancestry.com (http://www.ancestry.com : accessed 9 October 2009); citing National Archives microfilm M637, roll 11. Brent H. Holcomb, South Carolina Deed Abstracts 1773-1778: Books F-4 Through X-4 (Columbia, S.C. : SCMAR, 1993), 195-196. South Carolina, “Colonial Land Grants (Copy Series),” entry for Richard Stratford, 1770, vol. 21:159, item 2. South Carolina, “State Plat Books (Charleston Series),” database, South Carolina Department of Archives and History (http://www.archivesindex.sc.gov/Default.html : accessed 30 September 2008), entry for Richard Stradford, 1785, citing series S213190, vol. 7:289, item 1. Ibid., vol. 3:198, item 2. Ibid., vol. 27:166, item 1. 1790 U.S. census, Cheraw District, South Carolina, p. 357, col. 1, line 185, entry for John Nelson. Lela Nelson Cooper, Nelsons in the American Revolution (Bowie, MD: Heritage Books, 1994), 45. John Asplund, The Annual Register of the Baptist Denomination in North America to the First of November 1790 (Southampton Co., VA: J. Asplund, 1791), 39. Townsend, South Carolina Baptists, 103. South Carolina, “Petitions to the General Assembly,” database, South Carolina Department of Archives and History (http://www.archivesindex.sc.gov/Default.html : accessed 30 September 2008), entry for Joseph Tiller, 1791, citing series S165015, item 177. Charleston Baptist Association (South Carolina). “Minutes of the Charleston Association : High Hills of Santee, October 30th, 1790,” Early American Imprints (Worcester, Mass. : American Antiquarian Society, 1955-1983), microopaque, first series, no. 25287, p. 2. Bethel Baptist Association (South Carolina), “Minutes of the Bethel Association : Held at the Baptist Church on Jamey’s Creek, Spartanburgh County, S.C. Began on Saturday Aug. 13th, 1791,” Early American Imprints (Worcester, Mass. : American Antiquarian Society, 1955-1983), microopaque, first series, no. 25168, p. 1. Townsend, South Carolina Baptists, 102-103. Kershaw County, South Carolina, Deed Book A:164-168. The Church of Jesus Christ of Latter-day Saints [LDS], “Pedigree Resource File,” database, FamilySearch (http://www.familysearch.org : 20 October 2008), entry for Richard Stratford (PIN 673077); submitted by Mr. Jody Dee Jones, Fort Collins, Colorado. Laurens County, South Carolina Deed Book, E:255; FHL microfilm 24,082. Laurens County, South Carolina Deed Book, E:454. Land Grant Maps: These Land Grant Maps Cover Part of Chester, Fairfield, Greenville, Laurens, Newberry, Spartanburg and Union Counties in South Carolina (Greenville, S.C.: A Press, 1976), Land Grant Map 13: Watts Mill. 1800 U.S. census, Laurens District, South Carolina, p. 22 (stamped, lower left corner), Revd Joshua Palmer; digital image, Ancestry.com (http://www.ancestry.com : accessed 9 October 2009); citing National Archives microfilm M32, roll 50. Townsend, South Carolina Baptists, 227, note 125. “Padget’s Creek Baptist Church Book Containing the Minutes, Rolls and Other Records of the Church” (typescript, 1935, University of South Carolina Library, Columbia), 2:31; FHL microfilm 22733, Items 5-6. Townsend, South Carolina Baptists, 228. "Upper Baptist Church of Dunkins Creek Petition to Incorporate," Upper South Carolina Genealogy & History 5 (Oct. 1987): 95-96. “Padget’s Creek Baptist Church Book, 1:25; FHL microfilm 22733, Items 5-6. I. M. Allen, The Triennial Baptist Register No. 2-1836, 188. Townsend, South Carolina Baptists, 302, note. Bethel Baptist Association (S.C.), “Minutes of the Bethel Association : Met at the Baptist Church on Jamey’s Creek, Spartanburgh County, South-Carolina, 13th August, 1796,” Early American Imprints (Worcester, Mass. : American Antiquarian Society, 1955-1983), microopaque, first series, no. 30063, p. 1. I. M. Allen, The Triennial Baptist Register No. 2-1836, 186-187. Judy McHam Davis, transcriber, One Hundred Years of Friendship: a History of Friendship Baptist Church 1801-1901 from the Church Minutes and Abstracts from the Church History (Spartanburg, South Carolina: Piedmont Historical Society, 1999), 1-7. Bethel Baptist Association (S.C.), “Minutes of the Bethel Association, of Baptist Churches : Met at Bethlehem Meeting-House, August 9, 1800, in Spartanburgh District, South Carolina,” Early American Imprints (Worcester, Mass. : American Antiquarian Society, 1955-1983), microopaque, first series, no. 36949, ? Judy McHam Davis, transcriber, One Hundred Years of Friendship, 1. Bethel Baptist Association (S.C.), “Minutes of the Bethel Baptist Association : Met at New-Hope Meeting House, Spartanburgh District, (S.C.),on Saturdy, October 4th, 1806, and Continued Until the Tuesday Morning Following,” Early American Imprints (Worcester, Mass. : American Antiquarian Society, 1955-1983), microopaque, first series, no. 50644, p. 3. Townsend, South Carolina Baptists, 227, note. Bethel Baptist Association (S.C.), “Minutes of the Bethel Association : Met at the Baptist Church on Jamey’s Creek, Spartanburgh County, South-Carolina, 13th August, 1796,” p. 1. Bethel Baptist Association (S.C.), “Minutes of the Bethel Baptist Association : Met at Bethel Meeting House, Spartanburgh District (S.C.), Saturday, August 11, 1804, and Continued Until the Tuesday Following,” Early American Imprints (Worcester, Mass. : American Antiquarian Society, 1955-1983), micoropaque, second series, no. 5791, p. 4. Townsend, South Carolina Baptists, 263. Bethel Baptist Association (S.C.), “Minutes of the Bethel Baptist Association : Met at Bethel Meeting House, Spartanburgh District (S.C.), Saturday, August 11, 1804, p. 1. Townsend, South Carolina Baptists, 267, table. I. M. Allen, The Triennial Baptist Register No. 2-183, 186. “Padget’s Creek Baptist Church Book, 2:31; FHL microfilm 22733, Items 5-6. John Belton O’Neall and John A. Chapman, The Annals of Newberry (Newberry, South Carolina: Aull & Houseal, 1892), 144. Chelsea L. Lawless, “Settlement of the Whitewater Valley, 1790-1810,” Indiana Magazine of History, 43 (March 1947), 27. Margaret R. Waters, Indiana Land Entries: Cincinnati District, 1801-1840 (1948; reprint; Baltimore: Genealogical Publishing Company, 2003), 65. Alpheus H. Harlan, History and Genealogy of the Harlan Family, 229. “Langston Baptist Church,” The Scrapbook, a Compilation of Historical Facts About Places and Events of Laurens County, South Carolina (Laurens, South Carolina: Laurens County Historical Society and Laurens County Arts Council, 1982), 459. Wayne C. Palmer, Pedigree Chart for William Elihu Palmer, supplied 1996 by Wayne C. Palmer, Sun City, Arizona. Wayne (1915-2000) was a great-great-great grandson of Rev. Joshua Palmer. The chart does not list any sources for the information. Belle Palmer, “Palmer History,” p. .
 Lewis Palmer to Ella (Mrs. Austin B.) Palmer, undated letter, in files of Genevieve Howard, Rapid City, South Dakota. Notes taken by Donna Meszaros, Phoenix, Arizona in 1992. Lewis Palmer (1886-1971) of Ladysmith, Wisconsin was a great-great grandson of Rev. Joshua Palmer. Ella Palmer (1892-1982) was the wife of Austin Palmer (1881-1970), brother of Lewis. Austin and Ella lived at Audubon, Minnesota. Belle Palmer, “Palmer History," p. .
 Genevieve Howard, “Family History,” p. .
 J.H. Spencer, A History of Kentucky Baptists from 1769 to 1885 (1886; reprint; Lafayette, Tennessee: republished by Church History Research & Archives, 1976), 1:230. "Petition to Congress by Citizens of the Territory," Territorial Papers of the United States, Volume 7, The Territory of Indiana, 1800-1810 (Washington: GPO, 1939), 691. Willard Heiss, Indiana Source Book: Genealogical Material from the Hoosier Genealogist, 1961-1966 (Indianapolis: Genealogy Section, Indiana Historical Society, 1977), 1:184. Willard Heiss, Indiana Source Book: Genealogical Material from The Hoosier Genealogist, 1967-1972 (Indianapolis: Family History Section, Indiana Historical Society, 1981), 2:207. “Franklin County, Indiana Tax Lists, 1812-1848,” Indiana DAR Genealogical Records Committee Report, series 1, vol. 232 (1968): 5. Joshua Palmer Sr. (Dearborn County) credit under file, certificate no. 315, Cincinnati, Ohio, Land Office; Land Entry Papers, 1800-1908, Records of the Bureau of Land Management, Record Group 49, National Archives, Washington, D.C.
 Margaret R. Waters. Indiana Land Entries, 65. Union County, Indiana Deed Book A:247: FHL microfilm 1,571,488. The land was originally entered by Jonathan Hollingsworth in 1807. Margaret R.Waters, Indiana Land Entries, 66. Mary G. Apple, “Indiana Volume of Fayette, Cass & Lake Counties and Bible Records of Cromwell, Harris, Oliver Families,” Indiana DAR Genealogical Records Committee Report, series 1, vol. 710 (1967-1968): 5. Henry A. Ford and Kate B. Ford, History of Hamilton County, Ohio, with Illustrations and Biographical Sketches (Cleveland: L.A. Williams, 1881), 313. David Benedict, A General History of the Baptist Denomination in America, and Other Parts of the World (Boston: Lincoln & Edmands, 1813), 2:547. Willard Heiss, Indiana Source Book: Genealogical Material from The Hoosier Genealogist. Volume 3, 1973-1979 (Indianapolis: Family History Section, Indiana Historical Society, 1982), 36. Russell E. Bidlack, “Zachariah Sparks (Died ca. 1781) of South Carolina,” The Sparks Quarterly 9 (September 1961): 573. 1790 U.S. census, Laurens County, South Carolina, p. 11 (ink), col. 2, Francis Lufsey; digital image, Ancestry.com (http://www.ancestry.com : accessed 9 October 2009); citing National Archives and Records Administration microfilm M637, roll 11. The Church of Jesus Christ of Latter-day Saints [LDS], Pedigree Resource File,” database, FamilySearch (http://www.familysearch.org : 9 October 2009), entry for Joanna Lovesy (PIN 829811); submitted by John D. Hoff, III, Tulsa, Oklahoma. Sara M. Nash, Abstracts of Early Records of Laurens County, South Carolina 1785-1820 with Name Index and Revolutionary War Service (Fountain Inn, South Carolina : S. M. Nash, 1982), 256-257, citing Laurens County Deed Books H:116 and H:118. Shirley Keller Mikesell, Early Settlers of Indiana’s “Gore” 1803 to 1820 (Bowie, Maryland: Heritage Books, 1995), 41. Maurice Holmes, Court Records of Franklin County, Indiana (Shelbyville, Indiana: M. Holmes, 1987), 18. 1820 U.S. census, Liberty Township, Franklin County, Indiana, p. 211 (stamped), Joshua Palmer; digital image, Ancestry.com (http://www.ancestry.com : accessed 10 October 2009); citing National Archives microfilm M33, roll 13. Union County, Indiana, Records of Wills, Inventories &c., Book 1:21, inventory of the estate of Mary Palmer, 1823; FHL microfilm 1,548,623. Maurice Holmes, Court Records of Union Co. Indiana 1821-1845 (Shelbyville, Indiana: M. Holmes, 1988), 4-6, 72. Alpheus H. Harlan, History and Genealogy of the Harlan Family, 532. 1800 U.S. census, Laurens District, South Carolina, p. 209 (stamped), James Conaway; digital image, Ancestry.com (http://www.ancestry.com : accessed 9 October 2009); citing National Archives and Records Administration microfilm M32, roll 50. Union County, Indiana Deed Book A:261; FHL microfilm 1571488.